15 years ago, Kollel Chatzos, Eretz Yisrael was formed when five friends decided to follow the age old custom of arising at midnight to learn Torah. Today, over eighty Talmidei Chachamim learn each night at Kollel Chatzos, Eretz Yisrael. 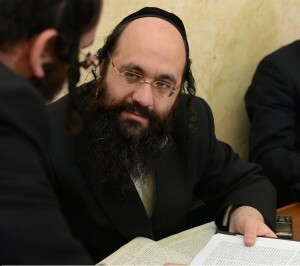 An interview with Rabbi Yehoshua Meir Deutsch, shlita, the dynamic Rosh Kollel of Kollel Chatzos, Eretz Yisrael. What impelled you to create a Kollel Chatzos? I thought that arising at midnight to learn Torah was only for the tzaddikim of old. The truth is, 15 years ago when I first decided to open Kollel Chatzos, Eretz Yisrael, people though I was crazy. The idea of arising at midnight to learn Torah was unheard of, at least in this day and age. Yet so many of our seforim speak about the importance of devoting the auspicious midnight hours to limud haTorah and avodas Hashem. These hours are precious. People who come to visit our Beis Medresh in the middle of the night, are always amazed to find it crowded with lomdei haTorah. The kedushah there is palpable – and it’s no wonder: chatzos is a time of brachah, a true eis ratzon. The holy Zohar brings that at dawn, the Creator stretches forth his scepter of kindness; whoever has merited standing and learning during the night may stretch out his hand and touch it. The tefillos recited during those hours are powerful and are m’sugal to bring down yeshuos. The nighttime hours, and especially the hours of chatzos, are the times of greatest clarity. The world is still and there are no distractions. The learning is pure and untainted. The avreichim are able to really shteig in their learning. Watch an inspirational video about the power of chatzos or see pictures of Kollel Chatzos in action. Could you give us a glimpse into what goes on at Kollel Chatzos, Eretz Yisrael?. “At Kollel Chatzos, Eretz Yisrael, the night begins with the recital of Tikkun Chatzos. The avlei Tzion – the mourners of Zion, remove their shoes and lower themselves to sit on the ground. Bent over their Tikkun Chatzos, they sob with pain as they mourn the churban of the Beis Hamikdash, the Exile of the Shechinah and the sufferings of the Jewish People. Their eyes flow with tears as they beseech Hashem to put an end to our bitter galus, and pray for the individual suffering of each member of Am Yisrael. These tefillos are precious, for according to our seforim hakedoshim, Mama Rochel brings them directly to the Kisei Hakavod. I often remind the avreichim at Kollel Chatzos, Eretz Yisrael, that when we recite Tikkun Chatzos, we are not only mourning for the exile of Am Yisrael. Rather, we are also mourning our own soul’s exile into evil desires, sadness, depression, and materialism. We beseech Hashem to send the Moshiach to redeem all of Klal Yisrael from this bitter galus, as well as each individual Jew from his own private exile. The moment we conclude the recital of Tikkun Chatzos, the “war of Torah” begins. The entire Beis Medresh throbs with the vibrant song of limud Hatorah. With chaburos, chavrusos and shiurim in both Gemara and Poskim, as well as Kabalah and Chassidus, the melodious song of limud Hatorah blend together into a beautiful symphony of avodas Hashem. The achdus is amazing. Sefardim, Ashkenazim Chassidim and yeshivisheh ovdei Hashem all learn together at Kollel Chatzos, Eretz Yisrael. The avreichim range in agefrom twenty to close to eighty! Working men who rush home from their jobs to go to sleep early in order to come to Kollel Chatzos, Eretz Yisrael, learn b’chevrusa with great talmidei chachamim who devote every moment of their day – and their night – to Torah study. Can you tell us about some of the avreichim who are learning at Kollel Chatzos, Eretz Yisrael? And then there’s Rav Moshe Shor, shlita. He’s been learning at Kollel Chatzos, Eretz Yisrael for over twelve years, yet he’s never missed a night. Even on the night of his son’s wedding, he arrived right after the mitzvah tantz, wearing his streimel and bekesher! Among the men learning at Kollel Chatzos, Eretz Yisrael, there are several who travel from Jerusalem and Beit Shemesh to Beitar each night to learn at the Kollel. Isn’t there something similar available for them there? “Yes, there is, but Kollel Chatzos, Eretz Yisrael, is the ‘father of the kollel chatzos network.’ Kollel Chatzos, Eretz Yisrael is special; there is an incredible sense of kedushah and achdus that has yet to be duplicated elsewhere. The feeling of growth and avodas Hashem is palpable. In terms of gashmiyus, Kollel Chatzos, Eretz Yisrael has its own magnificent Beis Medresh. Refreshments and drinks are available around the clock. Although the Beis Medresh is fully air conditioned, after too many occasions when the electricity was down due to inclement weather we recently installed a wood burning stove. After all, I couldn’t allow the men of Kollel Chatzos, Eretz Yisrael to continue learning in a freezing Beis Medresh, and of course, despite the lack of heat, none of them would miss a night of limud Hatorah, so they all showed up bundled in layers, and layers (and more layers) of clothing! Now, thanks to our new wood burning stove, baruch Hashem, no matter what the weather, the Beis Medresh remains warm – both in gashmiyus as well as in ruchniyus. You’re supporting some ninety avreichim, most of them heads of large families. That’s a huge responsibility. How do you do it? Siyata D’Shemaya. That’s the key. It takes a real miracle to support so many chashuva avreichim. Each avreich receives a $700 monthly stipend, and before a Yom Tov that amount is doubled. The nashei chayil of Kollel Chatzos, Eretz Yisrael receive a $100 prior to each Yom Tov, a small token of our appreciation for their mesirus nefesh in enabling their husbands devote their nights to Torah. Baruch Hashem there are wonderful people who want the zechus of supporting talmidei chachamim who devote their nights to limud Hatorah with tremendous mesirus nefesh. One of the most sought-after arrangements is the Yissachar-Zevulon contract, approved by the greatest poskim. The donor and the Torah learner sign a contract, meriting each with an equal portion in the learning. Of course, for this I choose only the best learners, talmidei chachamim, real masmidim who never miss a night. The two become true partners; the Torah learner davens for his donor-partner and his family, every night at chatzos. People mamash see nissim in the zechus of these contracts, especially in the area of parnassah. I am often astonished by the power of this segulah. One of our supporters was so satisfied with the results that he added another contract for his business! Dozens of times, I’ve seen how on days when Yissachar has learned with exceptional spiritual elevation, Zevulon reports a special success or a yeshuah. We have a range of other possibilities for participation: hourly or daily, through a standing bank order or a one-time donation, each according to his ability. Oftentimes, in the middle of the night I will get an emergency phone call from one of our supporters asking us to daven for someone who is seriously ill. I stop the learning for a few minutes to ask everyone to daven for that person’s refuah and dedicate their learning to his zechus. Sometimes, we also conduct a pidyon nefesh. Baruch Hashem the results have been amazing! But I really shouldn’t be surprised. After all, during the hours of chatzos, the shaarei Shemayim are open to receive our tefillos, and they are brought directly to the Kisei Hakavod. And of course all our donors are listed in the Kollel’s kvittel. We daven for them each week at the Kosel and Kever Rochel, and monthly in Meiron. Each name and request is mentioned slowly and with concentration. Baruch Hashem we’ve seen incredible yeshuos! I’d like to take this opportunity to invite anyone reading this to personally visit Kollel Chatzos, Eretz Yisrael, next time you are in Eretz Yisrael. Personally, I think it should be counted among the mekomos hakedoshim there.